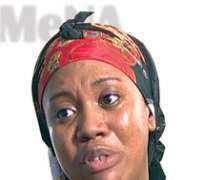 Star Actress, Stella Damasus-Aboderin, in this interview, with Bayo Adetu talks about life as a widow, her pet project and other issues. Q: What prompted the television programme that your entertainment outfit, SDA, is working on? A: I have always wanted to produce my own television programme and I started learning the whole process. I started as an actress and I have done some TV jobs for other people. But my ultimate goal from the outset is to produce my own television programme. My vision is to make a statement and try to add some quality to what we have on ground. So, even if I am still going to work for other people, I want to create my own television production outfit. You can not criticise other people when you have not done anything in that regard. Q: Considering the years you have spent in the movie industry, do you think you are ready to go into this? A: I'm more than ready. The Nigerian entertainment industry is the best way to learn. A lot of people are good in this industry today, not just because they are educated. If it is education, I am a graduate and I was the only female directing student in my set. In fact, I made a second class upper. It is not all about studying, because I am also used to all the equipment. So, I am more than ready. But since I cannot do everything alone, I'm working with people that I believe are very talented. Q: What is your outfit all about? A: SDA Productions is a company that I registered over eight years ago. My dream is to become one of the biggest entertainment outfits, a kind of one-stop for anything and everything. That was why I registered the company. I have a license to run an entertainment television, radio programmes, in fact, anything that has to do with entertainment. For me, I wanted a company where I could employ young people who want to make a difference. Q: Some of your programmes are about women; why? A: I am a woman and there are lots of issues surrounding us, that a lot of us are unable to voice out. What I am doing is to get an avenue where the voice of every woman can be heard. They don't have to be in government before they can speak. There are other segments on tourism, kids, charity and others. The whole idea is to cater for everybody. Q: It is believed that if your late husband were to be alive, your musical career would have improved? A: When my husband was alive, we concentrated more on the album that he was supposed to record, and of course the band. We did not discuss about my own album. He knew more about the music business. I was more into television production and acting. I was only singing with him but didn't know much about the music business. I don't dabble into anything that I am not ready to do. If it is to record an album or to shoot a musical video, that is no problem, but the question is: do I understand the business aspect of it? That is why some musicians are complaining that they are not making money. I am taking my time to plan very well before going into any field. Q: With all the programmes you have, how have you been able to take care of your children? A: God has been taking good care of us. He knows why I have two children. He knows why I am a single parent and He knows why he puts those visions and ideas in my head. Aside that, I think the other thing is priority. I always have a scale of preference but what is important to me at every point in life are my children. Once I'm able to spend quality time with them, get involved in their school assignments and development, I am fulfilled. Q: Do you still miss your late husband? A: That is obvious! Of course I do. There is no way I can forget him, even if I get married again and have grand-children. I lost my younger brother in 1991 and every October 29, I still remember him and cry. As for my late husband, I take consolation in things that will make him happy wherever he may be now. See, don't let anybody deceive you that time will reduce the pain, it is just the way you decide to carry on that matters. Q: What lessons have the death of your husband taught? A: That the most important thing in life is life. We tend to run after the wrong things. My only happiness is that I was with a man that showed me love, taught me the meaning of love and how to appreciate people. For me, the appreciation of people around me is very important. The greatest wealth a man can have is the people around him that love him, not cars, money or other things. I am glad that the lessons I learnt from him make me what I am today. Know the value of life, sharing love and being truthful to yourself. I don't do things to impress others. And most importantly, hold on to God. I have tried it all; you can try friends, people you know, business partners… you can try anybody. They will always disappoint you at one time or the other. I have learnt that the most perfect thing that can help in life is God. Q: What are your chances of getting married again? A: Chances? Well, Una go ask God o! Q: I was browsing the internet recently and saw the deluge of suitors you have…? A: I don't get worried about that. In Igboland, when a baby is born and people hear that she is yellow, they will start to queue. It is not even the people that want to marry her, but their fathers. So suitors matter don tey, that is the least on my agenda. Q: What is life like as a single mother? A: Very challenging and you learn everyday. It would have been easier if I had been a single mother like that. But because I was married, it is not easy to change your lifestyle all of a sudden. It is not easy to be the one to make all the decisions yourself, fend for the children alone… In fact, I always thank God that I married the kind of man that I married because most of the help I am still getting from people today is due to his goodwill. Not because he gave people money or he was a wealthy guy, but because he was a good person. Q: How do you react to scandals, especially the one about you and RMD on the beach? A: Oh! At times, when I remember that story, I get annoyed because it never happened and the only person that got me out of that mess was my husband, because he was at the location. He was with us. But for that, it would have been a major scandal. But for him, how would I defend myself before him and his family? I almost quit acting because of that issue but my husband encouraged me to go on.